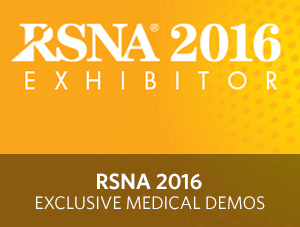 At this year’s RSNA, FEI is presenting their new comprehensive toolkit, Open Inventor® Medical Edition, for implementing software applications with 2D and 3D medical image computing workflows. Based on the widely used Open Inventor 3D toolkit, this edition provides high-level image visualization, processing and analysis through an object-oriented API. We also welcome you for a preview of version 9.7 (to be released early 2017). This new version of Open Inventor brings new tools for medical image processing, including image registration and center-line extraction, as well as powerful new image filters like Non-local Means. Finally, come and interact with our web-based demos for 3D visualization on remote 2D and 3D data! Meanwhile, visit our online demo portal.